Dylan Blenkhorn (Truro, NS) picked up his seventh career Parts for Trucks Pro Stock Tour victory at the Ron MacGillivray Chev Buick GMC 150 at Riverside International Speedway on Saturday night. Blenkhorn battled throughout the race with reigning series champion Donald Chisholm (Antigonish, NS) but it would be Blenkhorn getting the best of the hometown favorite on a final restart with seven laps remaining. Cassius Clark (Farmington, ME) was third, followed by George Koszkulics (New Glasgow, NS) and sophomore driver DJ Casey (Prospect, NS). 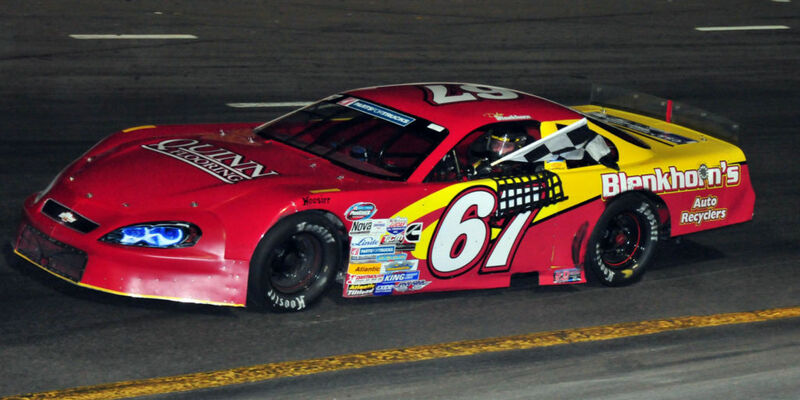 Chisholm started from the pole and jumped to an early lead, challenged by Blenkhorn soon after the first 50 laps. The two swapped the lead two more times before Blenkhorn took the point on lap 96 and held it for the win, in spite of fierce challenges by Chisholm for the remainder of the race. Six cautions, including two red flags for extended clean-up, slowed the event which saw 26 teams entered. Defending race winner Koszkulics passed more cars than anyone else coming from the back of the pack twice, the first time after being relegated to the rear for the start after wiring changes were required on his car between the heat race and the feature. Koszkulics made it to third before spinning while attempting a pass for the second spot. He pitted and resumed the race at the rear of the pack again, getting back to fourth before the checkers flew. Chisholm, Blenkhorn, Greg Proude (Springvale, PE) and Shawn Turple (Enfield, NS) each picked up Atlantic Tiltload Heat Race wins. Blenkhorn and Chisholm split the Linde Most Laps Led Award after each leading 75 laps in the feature. For the second straight race, Casey was the recipient of the King Freight Future Winners Award. Harry Ross White (Noel Road, NS) took home the Exide Batteries Rookie of the Race Award by finishing 12th in the main feature. Chisholm acknowledged his Nova Racing crew members pre-race with a 2015 Parts for Trucks Pro Stock Tour champion pennant for each as the team made their first start at their home track as defending series champions. The event included a touching tribute to Sharon McLean, Riverside staff and wife of track general manager, who passed away in March. 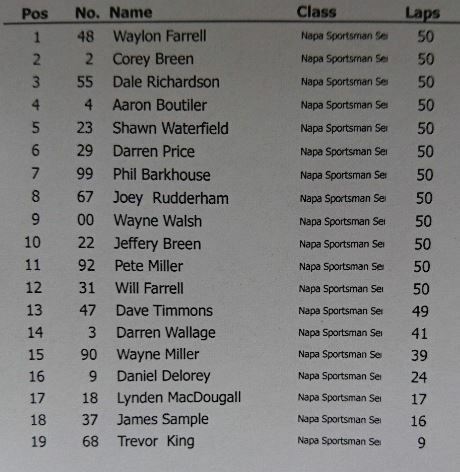 The NAPA Sportsman Series entertained fans for an exciting 50 lap feature prior to the Ron MacGillivray Chev Buick GMC 150 with Waylon Farrell (Conception Bay South, NL) crossing the line for the checkered flag ahead of Corey Breen (Antigonish, NS) and Dale Richardson (Stellarton, NS). The Parts for Trucks Pro Stock Tour is at Scotia Speedworld next weekend for the Nova Truck Centres Make A Wish 150 on Saturday, June 18th. Admission for Saturday’s Nova Truck Centres 150 is $25.00 for adults; $5.00 for youth; pit admission is $30.00. Children 7 and under are admitted for free. Tickets will be available at the gates on race day (Cash Only). Visit www.maritimeprostocktour.com for all event information. 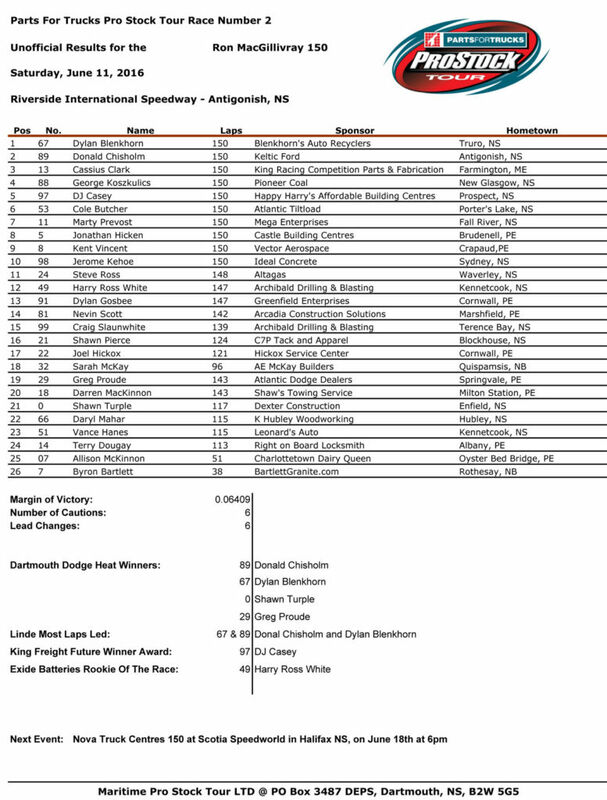 Riverside International Speedway management now turn their attention to the 10th-anniversary edition of the IWK 250 presented by Steve Lewis Auto Body, a three-day event set for July 14 to 16. 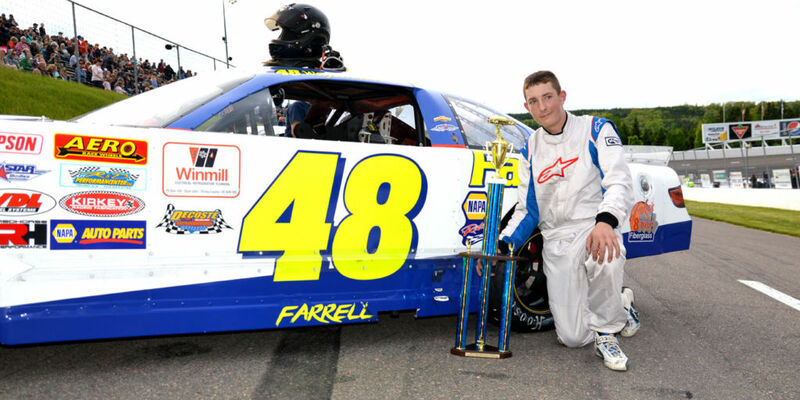 With the help of Rusty Wallace Racing Experience fans can feel the rush of Riverside July 14 and 15, the Highland Building Centres 100 for the NAPA Sportsman Series is centre-stage on Friday, and the IWK 250 takes place on July 15. Advance tickets will be available this week for the popular event. Ron MacGillivray Chev Buick GMC, located on Andrews Street in Antigonish Nova Scotia, is the #1 choice for all your automotive needs. This four-time Triple Crown Award winner has been serving Eastern Nova Scotia since 1986. Ron MacGillivray Chevrolet, “A name you can count on, a team you can trust.” To learn more about Ron MacGillivray Chevrolet please call 902.863.2803 or click www.ronmacgillivraychev.com. The Parts for Trucks Pro Stock Tour (PST) is considered the highest level of stock car racing in Canada. The Tour is recognized in the industry as one of the healthiest stock car racing series in North America. PST visits five tracks throughout the Maritimes during its May through September season. The Parts for Trucks Pro Stock Tour is owned and operated by Maritime Pro Stock Tour Limited. For more information, call our administration office at 902.481.2531 or clickwww.maritimeprostocktour.com .